We are in the final stretch of the semester. There is no better time to take advantage of the guided study sessions offered for the Circuits 1, Circuits 2, and Digital Logic courses. See the schedule for those sessions here. If you are not currently making at least a B in your class, you should be taking advantage of these sessions. If you cannot make it during the times on the schedule, email one of the Lab Assistants to set up a one on one study session. Advising and Registration are the biggest issues on the agenda for this month. Registration opens starting April 22nd. You are given a particular date based on the number of credits you have taken. Check here to see when you will be allowed to register for classes. You want to make sure you get advising before you sign up for classes so login to MyCollege and see who your advisor is. Email them to make an appointment to discuss what the best courses are for you to take next semester. Be aware that if you get financial aid and sign up for a class that is not in your program, they will drop you from the class. If you are unsure of how many credit hours you’ve taken, log in to MyCollege WebAdvisor and check your program evaluation using either the new tool (described below) or the old program evaluation tool. This is also where you can find out who your advisor is. If you do’nt have an advisor in the ET department, then please contact one of the faculty members on our Faculty and Staff page. 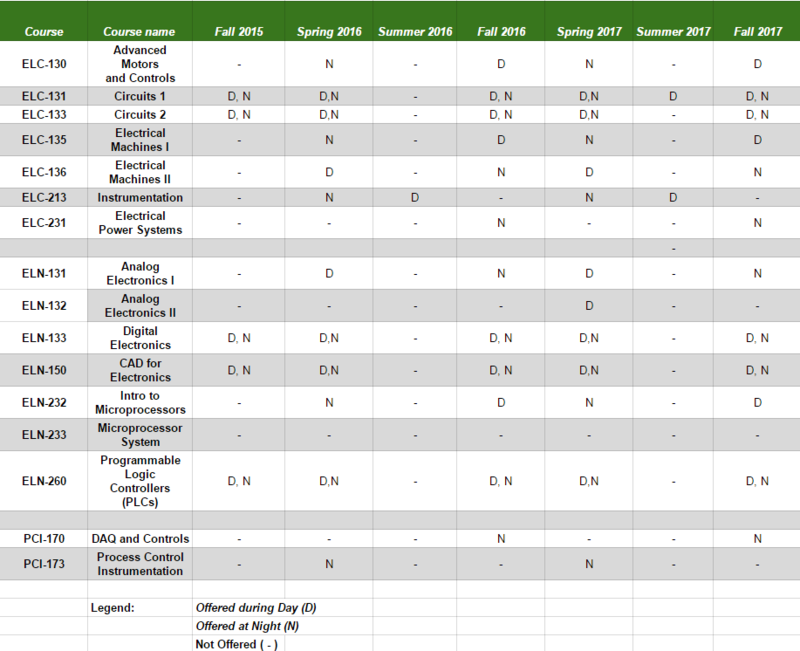 Based on previous years’ course offerings, we’ve made a spreadsheet to show when courses will likely be offered to help you plan your schedule. Click the image below to be taken to the most updated version of this document. CPCC has just released a new tool to help map your entire schedule at CPCC. Simply log in to MyCollege and click “Academic Planning” to access it. Inside this tool you can see your program evaluation, what courses you’ve already taken, times and sections for upcoming semester classes, access the course catalog, see test scores, see your unofficial transcript, and you can even search and sign up for classes all in the same place. Never before have so many options been as easily accessible for advising and registration. Your future is in your hands, and this tool helps you plan it all out. Use this to build your schedule before and while you meet with your advisor.